Signed: Case, dial, movement and buckle signed. 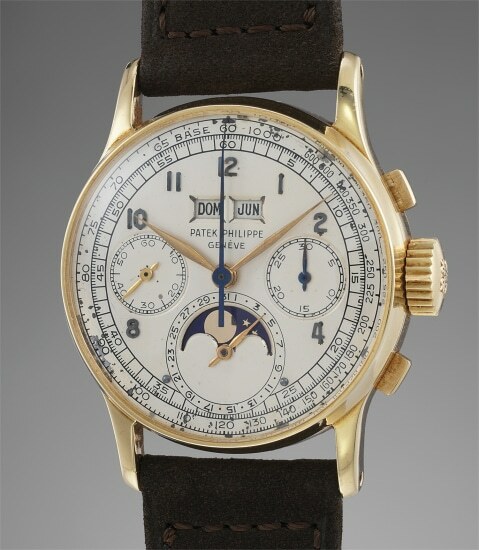 Accessories: Accompanied by Patek Philippe Extract from the Archives confirming the production of the present watch with raised gold hour markers in 1950 and its subsequent sale on October 5th, 1954. Further accompanied by the original fitted box, sales certificate dated October 4th, 1954 for the sum of 3,465 Swiss Francs, original certificate of origin, correspondence between Patek Philippe and the original owner, and original Patek Philippe product literature. A landmark model, the reference 1518 was the first perpetual calendar chronograph wristwatch ever produced in series when it was introduced in 1941. It’s remarkable how, in the midst of war-torn Europe, Patek Philippe had the audacity, courage, and foresight to begin manufacturing such a complicated and groundbreaking wristwatch. According to research, only 281 examples were manufactured until the reference ceased production in 1954, a remarkably small output for such an extended period of time. It paved the way for Patek Philippe’s celebrated successor references - the 2499, 3970, 5970 and most recently, 5270. No matter the horological advances or aesthetic refinements of these subsequent references, their basic architecture is clearly traced back to their progenitor, the 1518, making this reference one of the single most important references in modern horology. Consigned to auction by the family of the original owner, an important Brazilian attorney and real-estate developer, the dial is fitted with a correspondingly rare feature – a Portuguese day and date window. Originally, the watch was fitted with a Patek Philippe gold bracelet; however, during its only service at Patek Philippe in Geneva during the 1960s, the bracelet went missing during its return trip to Brazil. Adding to its desirability, the present example is accompanied by its original certificate of origin and receipt, with the watch itself costing 3,465 Swiss Francs and the bracelet an additional 885 Swiss Francs. Accompanying correspondence between the manufacture and the original owner indicates the owner was staying at the Hotel Bellevue in Berne, Switzerland and visited the salon in Geneva on October 4th, 1954. The watch was likely delivered with its guarantee and exportation paperwork to the hotel the day after the visit. Today, existing reference 1518s can generally be divided into two categories pertaining to the condition of the dial, which is arguably the most exceptional attribute of the 1518. The first comprises those most commonly found on the market. While they range from showing little to heavy wear, they all display some kind of restoration or cleaning to the dial. These watches make up a majority of the reference 1518s known to the market. Due to the reference's snap on case back and general construction, moisture easily seeped through the pushers or caseback, resulting in a spotted or slightly tarnished dial. As a result, many existing reference 1518 dials have been "touched up" at some point in their histories. The state of preservation of the present example’s dial falls into the second, exceedingly rare category – a reference 1518 with a dial that has seen no restoration or interventions whatsoever since the day it left the factory. The dial, while not flawless, has developed a stunning ivory hue and is completely original. The case shows signs of careful wear, yet the hallmarks are still present and the lugs strong and well-defined. Having remained carefully watched over and worn only by its original owner and retaining so much of its rarely ever seen original paperwork, this absolutely fresh-to-the-market reference 1518 is a horological treasure sure to be the star of any vintage watch collection. Case, dial, movement and buckle signed.